Info: HIDDEN AGENDA was Mark Foster (synthesisers, drum programming), Bruno Seiler (synthesisers, vocals) and Walter Stowe (vocals, synare), with the addition of Mark Lane on Electro-Harmonix Mini-Synthesizer on some recordings, from around Ventura, Ca., USA. In 1983, they released the classic electropop tape “Few Decisions”, including one of the – if not the - best ‘minimal electro’ track ever: “Life at the Top”, which made it already onto the „Night of the Banshee“ compilation back in 1996. HIDDEN AGENDA’s music was based around a Roland TR-606 drum machine and triggered analogue synths, adding melodies, synthetic percussion, and male vocals, think of IKO’83 as a comparison. Genetic Music has now re-released the complete 4-track tape plus adding the four previously unreleased tracks „Moving Pictures“, „Age of Haste“, „Living in Hollow“, and „Freeze up“ to the track list, and all tracks are just fabulous, and all remastered by no other than Andrea Sippel (Second Decay, Vendome). This is a must-buy for all into analogue electropop! 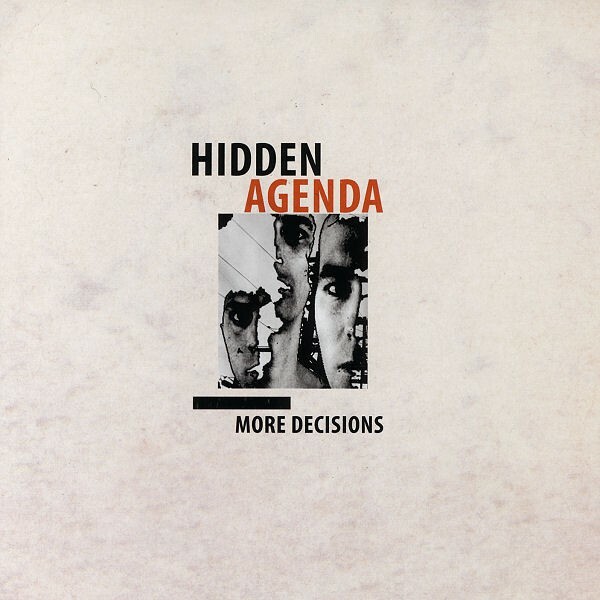 Customer evaluation for "Hidden Agenda - More Decisions CD (2010"